Died "from the effects of a Hun gas attack"
Imbert Stanley Pippard, known as Bertie, was born in Preston Plucknett, Yeovil, in 1894, the son of shoe maker and leather agent George Walter Pippard (1866-1942), from Islington, London, and dressmaker Sarah née Barnett (1867-1928) of Mudford. The Pippards were originally a Montacute family, plasterers by trade for generations. George's father Paul, moved to London where his first wife and daughter died of tuberculosis in 1865. Paul remarried and had two children; George and Ellen. What happened later is a mystery but by 1870 the two children were in the Yeovil workhouse, the entry in the register is 'deserted by parents'. George was later apprenticed to a shoemaker, he did well and had his own business in Watercombe, Yeovil. (Many thanks to Patricia Jones for this paragraph). Imbert was the fourth of eleven children. In the 1901 census the family, including 6-year old Imbert, were living in Watercombe. In the 1911 census the family were still living at Watercombe and Imbert, now 16, gave his occupation as 'Golf Club Assistant', and was employed as an assistant to the professional on the Yeovil and South Somerset Golf Links. 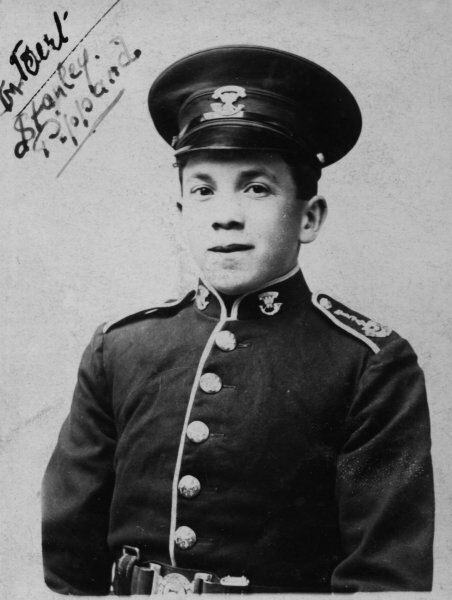 In March 1914 Bertie enlisted at Yeovil in the 1st Battalion, Somerset Light Infantry as a Regular soldier. His Service Number was 9720 and he was soon promoted to Lance-Corporal. At the outbreak of war in 1914 the 1st Battalion was in Colchester, with 11th Brigade, 4th Division. The Battalion landed at Le Havre, France with the British Expeditionary Force (BEF) on 22 August 1914 although Bertie didn't join his Battalion in France until 11 November 1914. The 1st Battalion, Somerset Light Infantry remained on the Western Front with 4th Division, throughout the war, suffering 1,315 losses and Bertie was to fight in several battles with his Battalion. 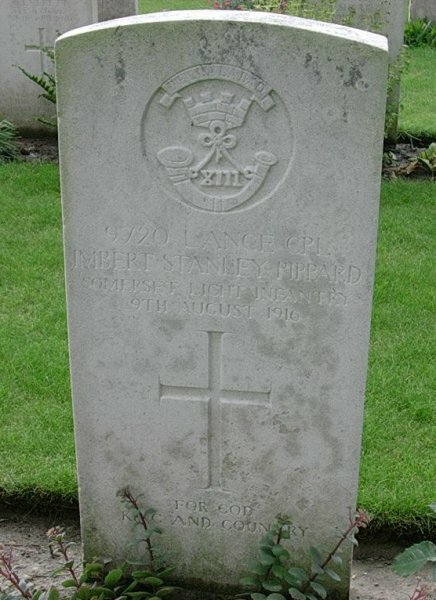 The British Army suffered, over the course of the entire 142-day campaign, some 415,000 casualties, including Imbert Stanley 'Bertie' Pippard who was killed in a gas attack on 9 August 1916. He was aged 22. The Somme campaign involved some twelve separate battles and finally came to an end on 18 November 1916. 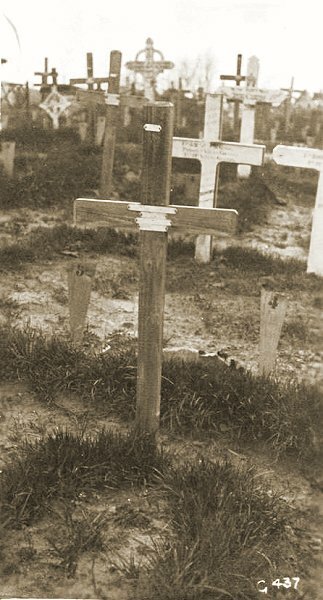 On 25 August 1916 the Western Gazette reported "On Saturday morning Mr and Mrs GW Pippard, of Watercombe, received notification from the War Office, that their eldest son, Lance Corporal Imbert Stanley Pippard, had died in France from the effects of a Hun gas attack. Accompanying the notification was letter signed by Mr D Lloyd George, Secretary of State for War, expressing the sympathy of the King and Queen with the family in their sorrow. Lance Corporal Pippard was formerly employed as an assistant to the professional on the Yeovil and South Somerset Golf Links were he was famously known as “Bertie.” He joined the 1st Somerset Regiment about March 1914, about five months before the outbreak of the war and went to France in November 1914, and apart from a short time spent in Leicester Hospital, where he was admitted suffering from inflammation of the lungs, he has been in France ever since. Lance Corporal Pippard was in his 22nd year. He was a genial and cheery young man and many will regret to hear of his early death." Bertie was interred Interred in Ferme-Olivier Cemetery, Leper, West-Vlaanderen, Belgium, Plot 1, Row C, Grave 9. His name is recorded on the War Memorial in the Borough (albeit incorrectly recorded as Pippard, JS rather than Pippard, IS) and on the Preston Plucknett War Memorial. 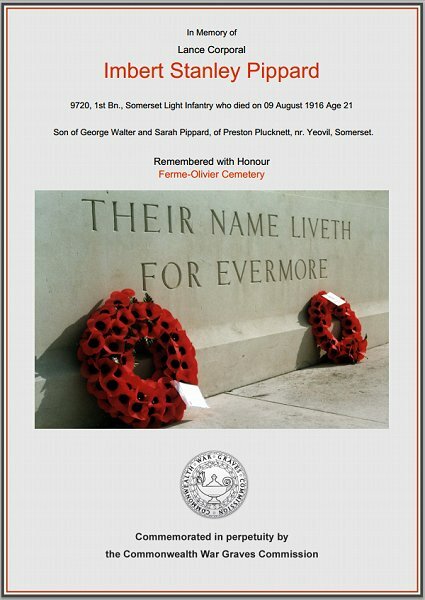 The following year, on 31 July 1917, Bertie's younger brother Sidney was killed in action during the first day of the Battle of Passchendaele - click here. 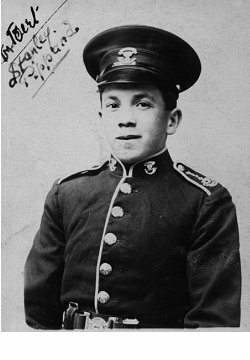 Imbert Stanley 'Bertie' Pippard in the uniform of the 1st Battalion, Somerset Light Infantry. Bertie's original grave marker, later replaced by the Commonwealth War Graves Commission with the current headstone. The current Commonwealth War Graves Commission headstone. The Commonwealth War Graves Commission certificate in memory of Bertie Pippard.